Gastro tourists may want to book flights to Singapore for the end of 2016. 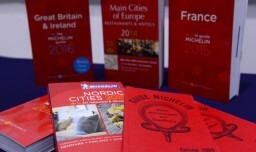 Michael Ellis, international director of the hallowed restaurant guide Michelin Guides, has just announced it’ll publish a Singapore edition in the second half of next year. A Michelin Singapore website, in collaboration with Robert Parker Wine Advocate, which is now headquartered in the city-state, will also be launched. Originally focused on Europe, there are now 25 guides across the world in cities including New York, San Francisco, Tokyo and Hong Kong.